Dual USB Ports ( 5V 1A and 5V 2.1A ) meet more than 99% of electronic products charging requirements. Can charge two devices at the same time. Charge is steady and fast. Smart digital display screen shows remaining power in digital format and the display is accurate to 1%. LED digital display makes you easily to see how much power your device has and whether the device needs to be charged. Use excellent circuit design and current & voltage control module to prevent your devices from over-charging, over-voltage, over-current and short circuit. Suitable for charging digital products, such as mobile phones, tablet, MP3, MP4 and game player etc. 5.71 x 2.80 x 0.57 inch portable cuboid size is like general cell phone, easy to overlap with the phone. It is a great accompany for you when you travel or have an outdoor gathering. 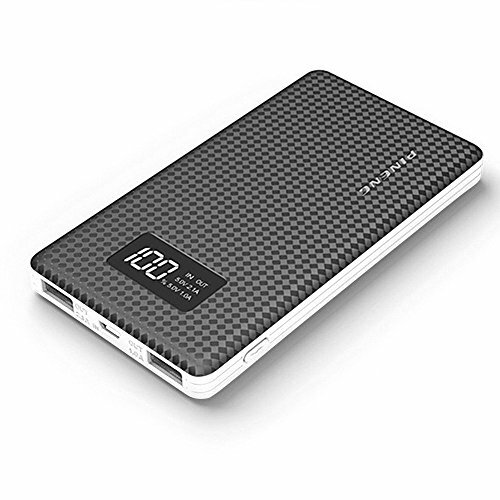 Great Power Bank With Great Features.